I had to post these pictures separately because we they were so special. We had a special treat this year at the Trout Club. 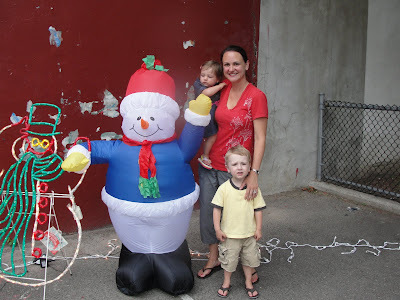 Cousin Wade and his girlfriend Tasha planned a VERY elaborate treasure hunt for the kids. There were 2 maps that the kids had to find pieces of, put together and then follow. No detail was spared. 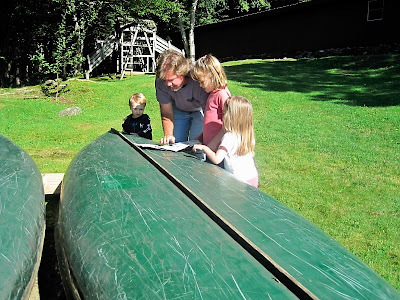 I mean the first map was drawn on birch bark....and the second map led to a boat that took the kids to Enchanted Island. They will never forget this one! OK, so I have been a VERY bad about updating the blog. Yeah, it has been over a month. BUT it was so nice going through these pictures again and remembering what a FUN week we had at the Trout Club. The kids were just go, go, go non-stop! AND to get to spend that much time with your cousins, their favorite part! Seven full days of activities (and they cook all meals...my favorite part!) would make anyone smile. Here are just a few of the MANY good pictures I got. 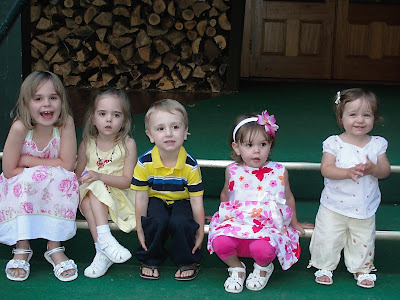 The cousins in age (and almost size) order. Laura Ann, Sarah, Richie, Natalie and Angela. Angela's first boat ride, she hated the life vest. Angela's first trip down the slide at the Bear's Den. Getting syrup at the Sugar Shack. They play movies at the Gassy (Prince St park) every Wednesday in the summer and this week it was Rudolph and Christmas Vacation. To get in the spirit they decorated the park with Christmas decorations and blasted Christmas tunes. As you can see, Santa came and there was even a "snow ball fight". Although the picture isn't good, Angela had a blast with the old Italian ladies. It was all pretty funny and we were lucky enough to have Lisa come as well. I don't think she would have believed it if she hadn't seen it. You would have to ask her about it.....only in the North End! 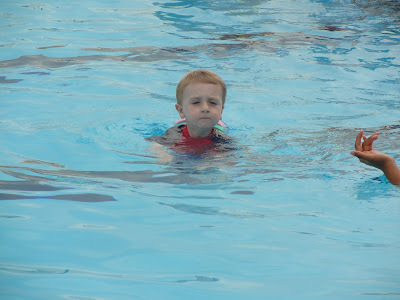 We have been trying everything to get Richie to enjoy his swimming lessons. Not sure what did it, but today he came home saying he had so much fun and wanted to go again. Maybe it is because Chris took him, maybe because he decided he wanted to become a good swimmer for the Trout Club, I don't know. Regardless, he is getting really good and hopefully will go back when we get home from Vermont. We made a big move in our house! 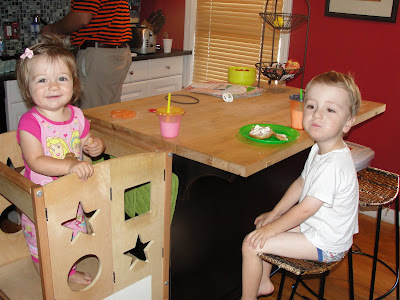 When we aren't sitting at the dining room table to eat Angela was in her high chair, Chris and I sat at the island and Richie stood in his kitchen buddy (one of the greatest pieces of kiddie "equipment" we ever bought!). Well we moved the kitchen buddy back up to its highest level so Angela can now stand there. She has been dying to get in it since she wants to do everything her brother does. Now Richie gets to sit in a "big boy seat" and one of the adults has to stand......hum, how does that work??? As you notice (as always now a days) Richie doesn't have any pants on. He insisted he wanted to sleep like Daddy.....with a white t-shirt and underwear. Again.....hum. "Dawn - We spent a day on the roof deck playing with the water table. I brought the tub up on the roof, filled it with water and put it in shade for Angela. She sat there playing for 2 hours. Also here are a couple of pics from the reptile exhibit at the library. The orange snake the lady is holding is called macaroni and cheese. Richard LOVED that name and told me I had to call him macaroni that day and for the next week!" "The first pic is Angela chowin down on the rest of Rich's ice cream treat that I got him because I felt so guilty about bringing him to swimming lessons. He was crying and asked me "WHY ARE YOU DOING THIS?" I felt so bad, but I bribed him to stay with ice cream. He ate literally 2 bites before he gave it up to Angela. The rest of the pics are from a day where the kids just wanted to take walks everywhere. Angela and Rich held hands the entire time we walked! Angela loves holding his hand and always tries to get him to hold hers! - Dawn"
The funny part is that in the car, Richie usually wants to hold Angela's hand and she doesn't want to hold his! "Here is a picture from a messy art day! We have 2 kinds of art. One is where we have to do art at the table and wash hands between activities. For the other.. pretty much anything goes.. i put out chalk and art stuff on the sidewalk and let them go nuts! Rich painted his feet and walked on the paper.. drew on the sidewalk (and Angela) with chalk, and Angela ate chalk and then once i stopped her, she moved on to coloring on the step and door! eek.. i guess you can't really control a 1 year old with chalk! they just loved getting messy! The other pics are of Angela in a blue dress that I love on her!"